With Valentines Day just around the corner, time to start thinking about some chocolate delicacies. One of my all time favorites is Chocolate Mousse….I guarantee this recipe is very easy and very quick…did I mention also very very yummy????? Start out with a few basic ingredients….you can find the “flavorless gelatin” in the “jello” isle of your favorite grocery store. Place mixing bowl and beaters in the freezer for at least 15 minutes. 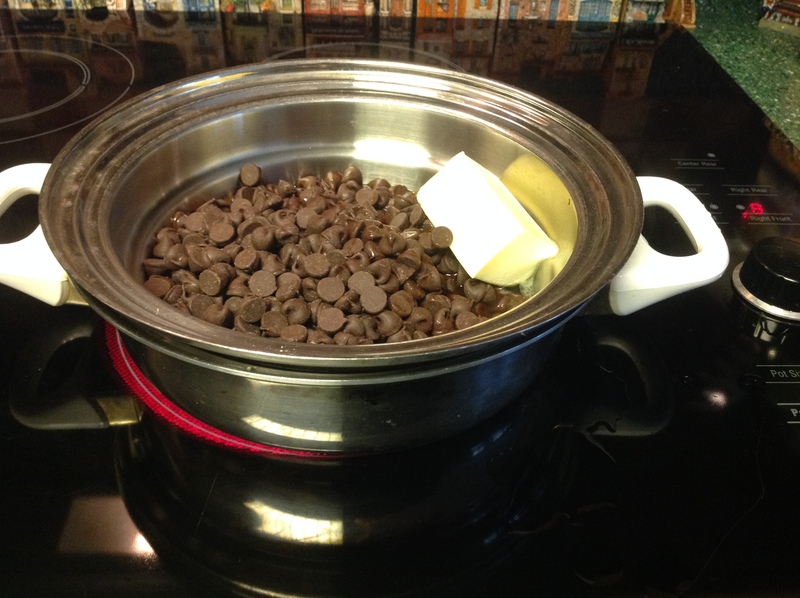 Add chocolate, butter, expresso (or coffee), and rum (or extract) to a double boiler pan (or a small metal bowl). Stir until almost melted, its fine if you have a few chunks of chocolate. Remove from heat and set aside. Add 1 teaspoon unflavored gelatin to ¼ cup of heavy cream. Let sit for 10 minutes. 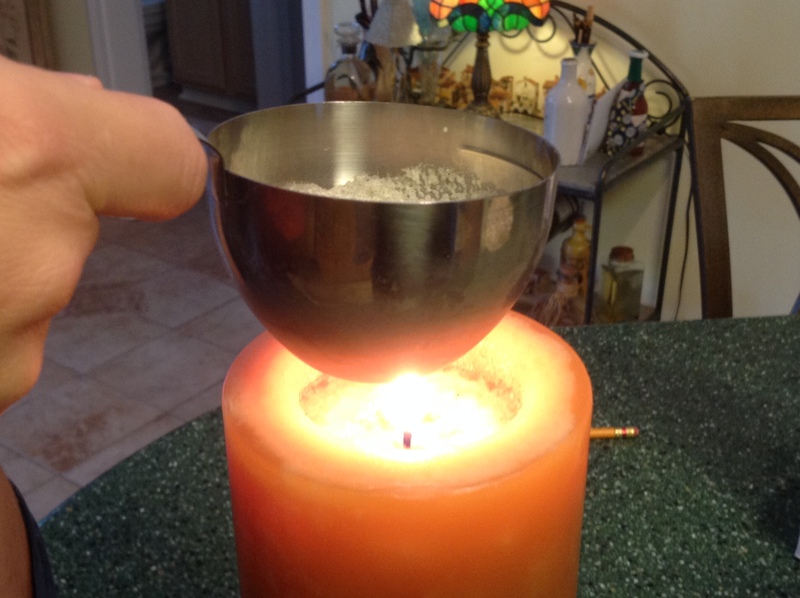 Heat by swirling the cup over a low gas flame or a candle. You just want to heat this, do not boil it. Stir mixture into melted chocolate and set aside. Remove your chilled bowl and beaters from the freezer and add remaining heavy cream. 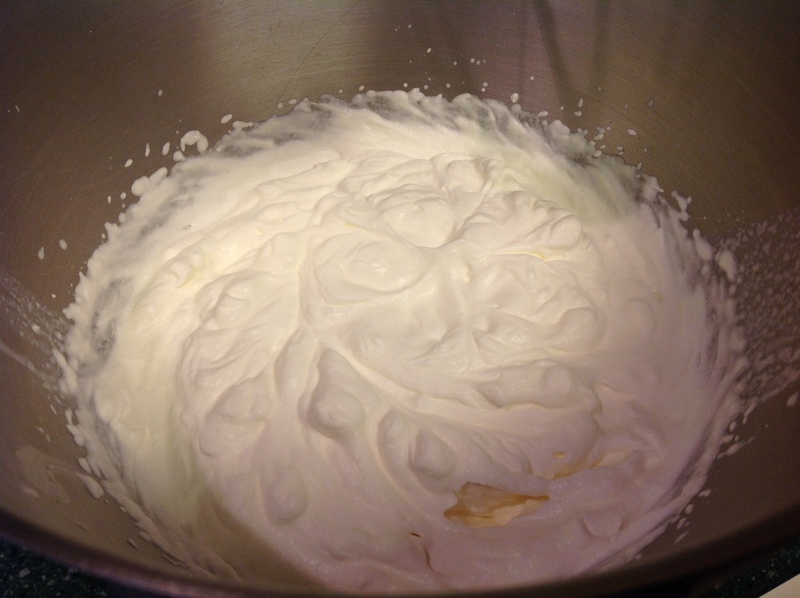 Whip cream until soft peaks form when beaters are removed from cream. Fold large dollop of cream into chocolate mixture. Continue adding cream until incorporated into the chocolate mixture. 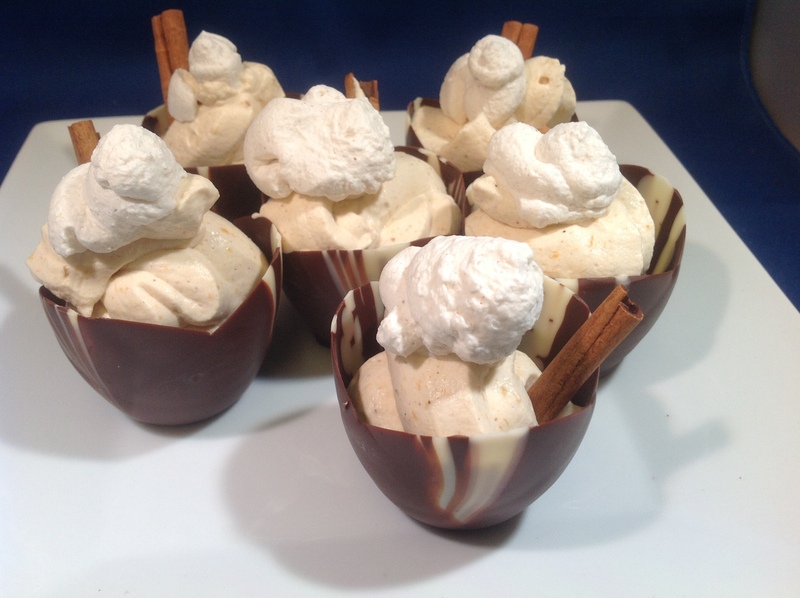 Spoon mouse into chocolate tulip cups or mini fillo shells. Chill mousse for 1 hour. Garnish with additional cream, cinnamon sticks and or fresh mint. Chill metal mixing bowl and mixer beaters in freezer. In top of a double boiler, combine chocolate chips, expresso, rum and butter over medium heat. Stir until almost melted, remove from heat. Let stand, whisking occasionally, until room temperature. Pour 1/4 cup whipping cream into a metal measuring cup or small pan. Sprinkle in the gelatin. Let gelatin “bloom” in pan for about 10 minutes. Heat by swirling the measuring cup or pan over a low gas flame (or candle). Do not boil or gelatin will be broken. Stir gelatin mixture into cooled chocolate and set aside. Remove chilled mixing bowl and beaters from freezer. Add remaining whipping cream (1 3/4 cups) and beat to medium peaks. Stir 1/4 of the whipped cream into the chocolate mixture. Fold in remaining cream. 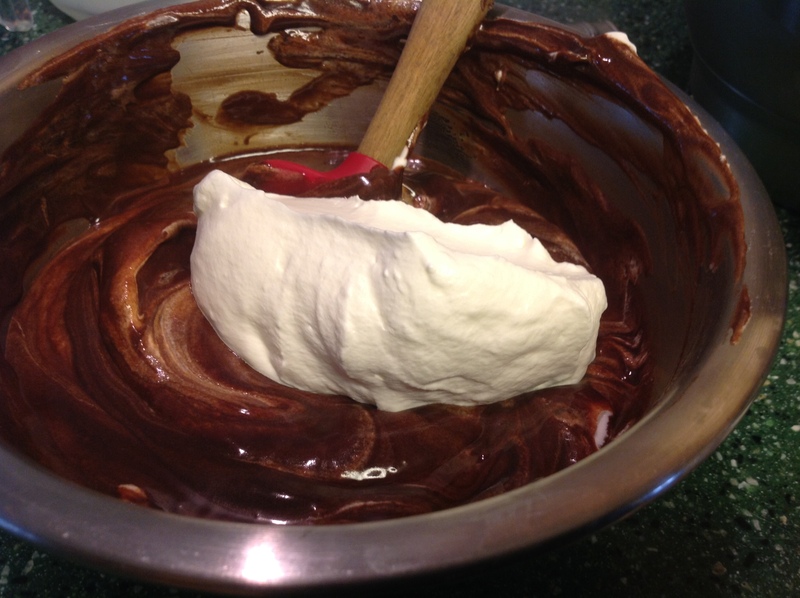 Do not over mix the mousse, its fine if the chocolate is streaked with the cream. 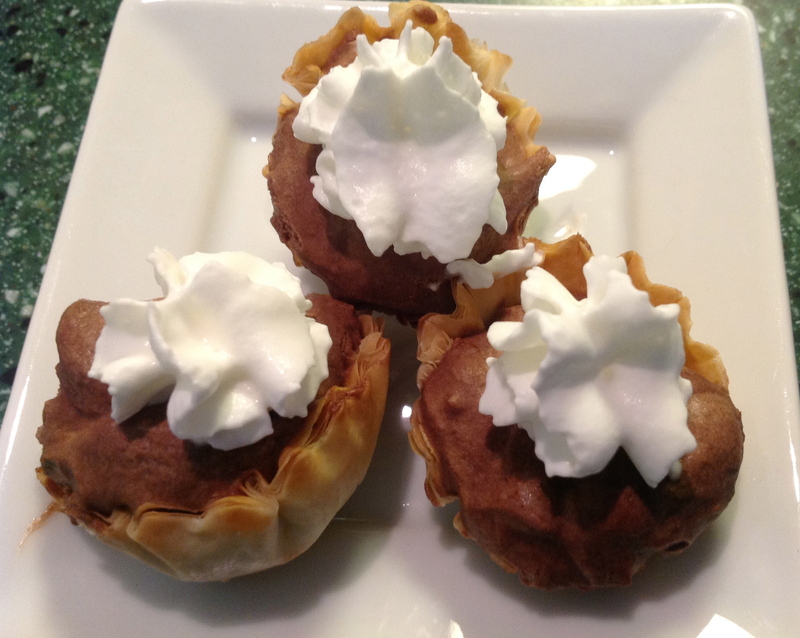 Spoon mousse into chocolate tulip cups or mini fillo cup shells (cooked according to package directions). Chill for one hour, garnish with additional whipped cream, cinnamon sticks and or fresh mint, if desired. Preheat oven to 450°F. Position a rack in the center of the oven. Combine zucchini, yellow squash, carrot, onion, shallot, orange juice, orange zest, salt and pepper in a mixing bowl. Cut four pieces of parchment paper 24×16-inches. Fold each piece of parchment paper in a half. Using scissors, cut each folded piece of paper into a heart shape. Place an opened parchment heart on your work surface with the fold running vertically. Brush one side of the heart lightly with oil. Place fillets on the oiled half, sprinkle seafood seasoning over fish and 1/4 of mixed vegetables on top. Fold the other half of the parchment heart over the fish, covering it completely. Crimp edges to form a sealed pouch. Place packages on baking sheet, lightly brush the top of each package with oil; bake until the paper is puffed and brown, about 15 minutes. Place heart shaped package on plate. Cut slashed in the parchment at the table to release the aromatic steam. 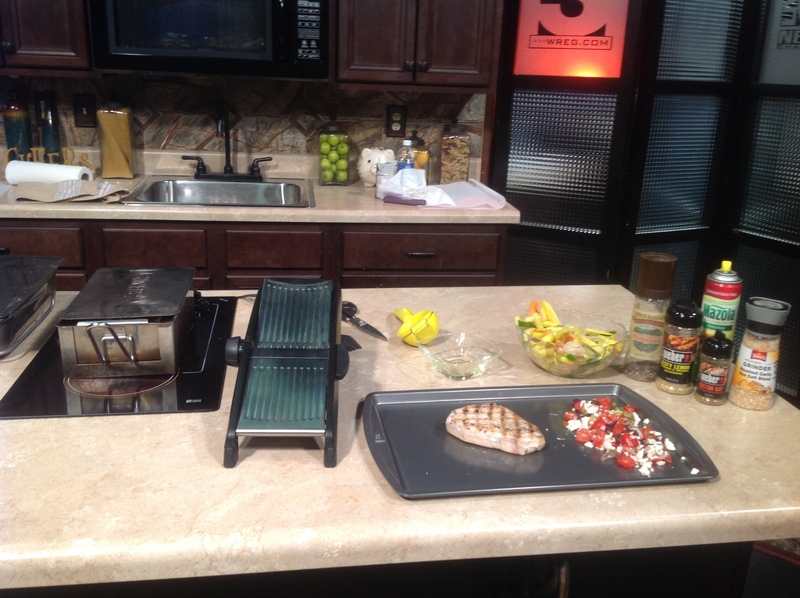 Place swordfish on hot grill or hot grill pan and sear on both sides. Remove from the grill. Place swordfish on one half of baking sheet lightly sprayed with cooking spray. At other half add tomatoes, shallots, olives, capers and feta cheese. Bake 10-15 minutes or until an internal temperature reaches 140°. Place swordfish on plate and top with vegetables and cheese. Place 1 teaspoon adler chips in stovetop smoker. Lightly spray grill with cooking pan spray. Place salmon on grill pan, squeeze one lemon over salmon, top with Zesty Lemon Seasoning and sliced lemons. Close top of smoker leaving 1-inch open and place on medium high heat. When smoke appears through opening, completely close cover. Cook 20 minutes or until internal temperature measure 140°F on a food thermometer. Remove salmon from grill pan. Serve with additional lemon, if desired. I just love traditions! Our annual New Year’s Eve tradition is a wonderful lobster meal. This year I stuffed the lobsters, purchased some shrimp fried rice at a local Chinese restaurant and some cole slaw from Germantown Commissary. Yum! What a meal! First purchase a couple of lobsters from your local grocery store. Bob is the “killer of the lobster” person in our house. I suppose I could do it, but I really like getting him involved in cooking. Never had a lobster before we started dating back in 1971. Bob’s family had a home on Long Island Sound and Bob grew up tending lobster pots with his dad. I can remember the first time I had a lobster at his parents house, his dad showed me how to open the little guy…but by the time I had it opened the meat was cold….hehehe. Good memories. Place lobster on a cutting board. Cut open the lobster by inserting your knife just underneath the head and the cutting down, splitting the belly (body and tail). Remove the “inners” (heart, guts, etc., but not meat). Remove the black vein and rinse under cold running water. 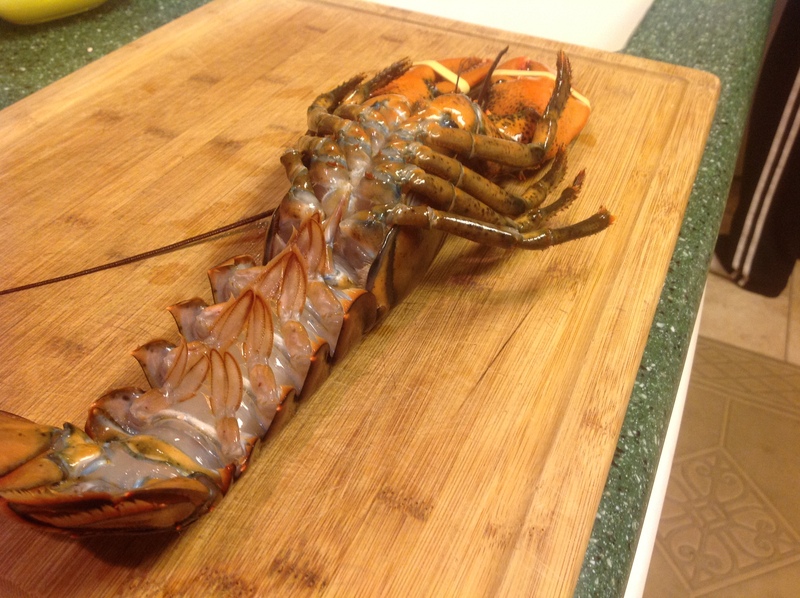 Place lobster on baking sheet. Preheat oven to 425 degrees F.
In a medium size skillet over medium high heat, melt 2 tablespoons of clarified butter. 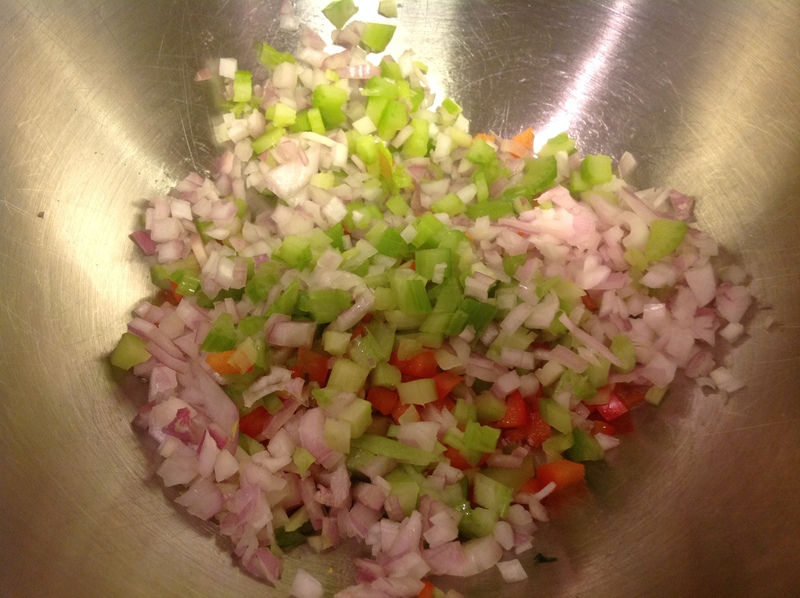 Add shallot, celery, red pepper and lemon seasoning. Saute until soft, about 10 minutes. Deglaze vegetables with wine, sherry (I just love Harvey’s Bristol Cream in lobster recipes) and lemon juice. Cook an additional 5 minutes over low heat. Remove pan from stove. Add 4 ounces of salad shrimp, pankos, parmesan cheese and chopped fresh parsley, mix until well combined. Place lobsters on baking sheet, stuff inside with stuffing and drizzle lobsters with 2 tablespoons of remaining clarified butter. Place in preheated oven and bake 15-20 minutes, or until the tail reaches an internal temperature of 140° on an instant-read thermometer. This meal would be very expensive in a restaurant, but you can make this at home for a fraction of that cost. It’s really pretty easy, and not that time consuming. 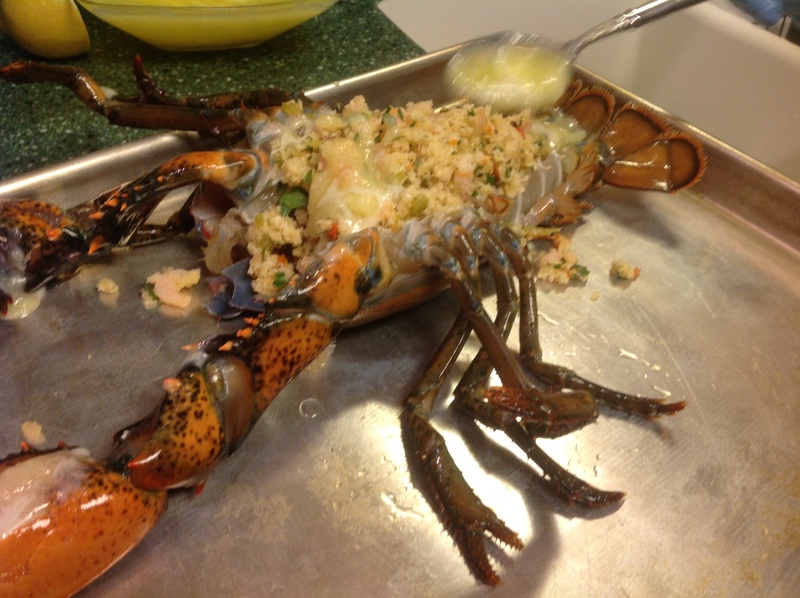 I hope you try this wonderful lobster recipe at home and feel free to leave me your comments. Bon Appetite! Prepare lobsters for stuffing. 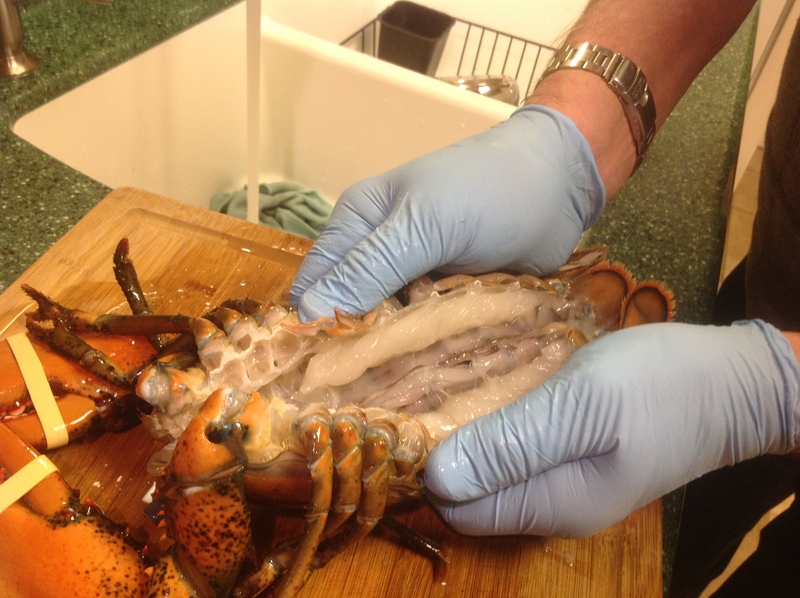 Cut open the lobster by inserting your knife just underneath the head and the cutting down, splitting the belly (body and tail). Remove the “inners” (heart, guts, etc., but not meat). Rinse lobster under cold water. Lightly season inside of lobsters with salt and pepper. In a medium size skillet over medium high heat, melt clarified butter. Add shallot, celery red pepper and lemon seasoning. Saute until soft, about 10 minutes. Deglaze vegetables with wine, sherry and lemon juice. Cook and additional 5 minutes over low heat. Remove pan from stove. 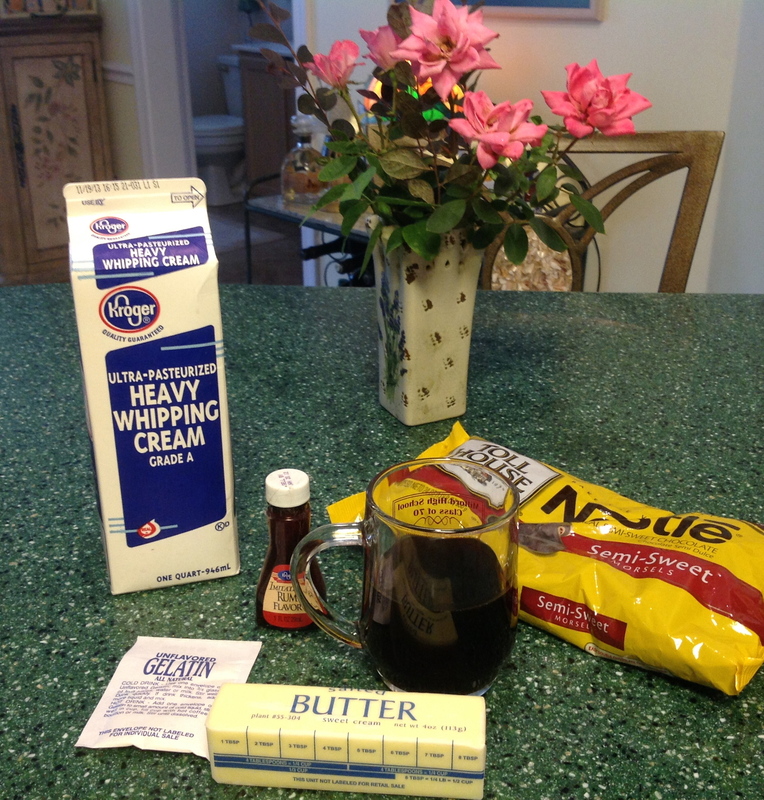 Add remaining ingredients and mix until well combined. Place lobsters on baking sheet and stuff inside with stuffing. Drizzle each lobster with 2 tablespoons of remaining clarified butter. Place in preheated oven and bake 15-20 minutes, or until the tail reaches an internal temperature of 140° on an instant-read thermometer. Click on the above link for this morning’s demonstration – Mediterranean Swordfish, Smoked Salmon and Tilapia en Papillote with julienne vegetables!